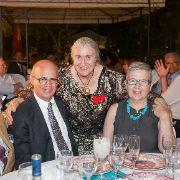 From left: Teodoro León Gross; Tecla Lumbreras, Vice Rector of Culture, University of Malaga; Arcadi Espada; Francisca Caracuel, Third Vice President of the Provincial Diputation of Málaga; Remedios del Río, Vice President, Spanish Friends; Fernando Francés, Director, Contemporary Art Center of Málaga; Patricia Nahmad, Co-President, Spanish Friends; Helena O’Hayon, Committee Member of the Spanish Friends; Marie-Noëlle Erize, Secretary, Spanish Friends; and Virginia Quero, Coordinator, La Térmica Cultural Center. The Spanish Friends of Tel Aviv University kicked off their 2017 lecture series in Marbella, with a lively debate at the home of the Association’s Vice President, Remedios Del Río entitled “National Populism and the Press”. Two renowned Spanish journalists/authors, Arcadi Espada and Teodoro León Gross, debated a host of issues facing Europe, including the rise of extremism on both the left and right, Marie Le Pen’s rise in French politics, Brexit, the US under President Donald Trump, and, not the least of which, the role the press plays in influencing and shaping public opinion and perceptions. After the spirited exchange of ideas between them, Espada and León Gross fielded questions from the gathered, which continued well into dessert. All agreed, however, that the evening was a great success.